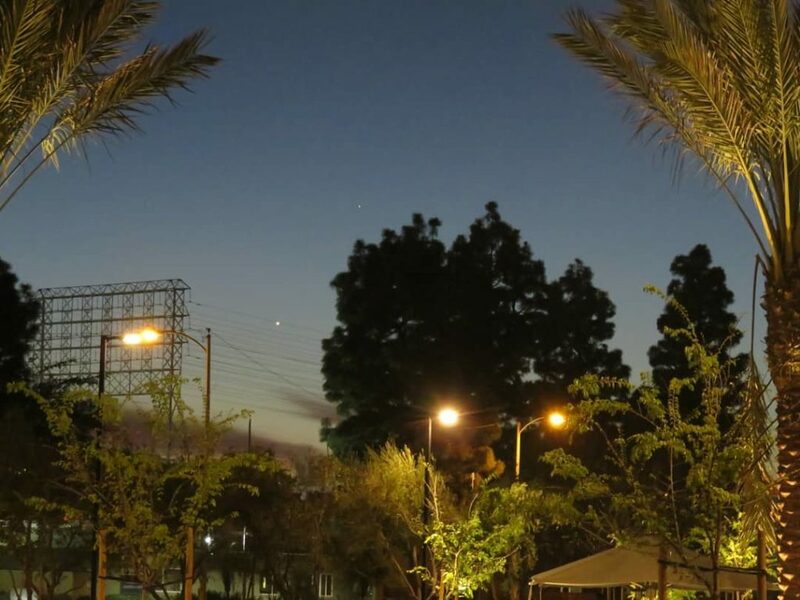 On June 30, 2015, Venus and Jupiter lined up very closely in the night sky as seen from Earth, just 0.3 degrees apart — closer than the diameter of the full moon! 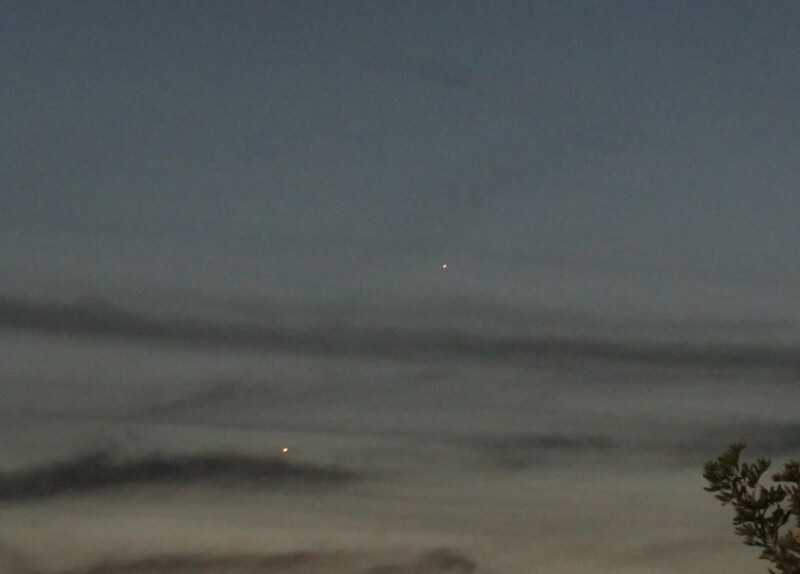 The day of the conjunction was muggy and cloudy, and I really didn’t expect to see them at all. To my surprise and relief, it cleared up and cooled off after nightfall. 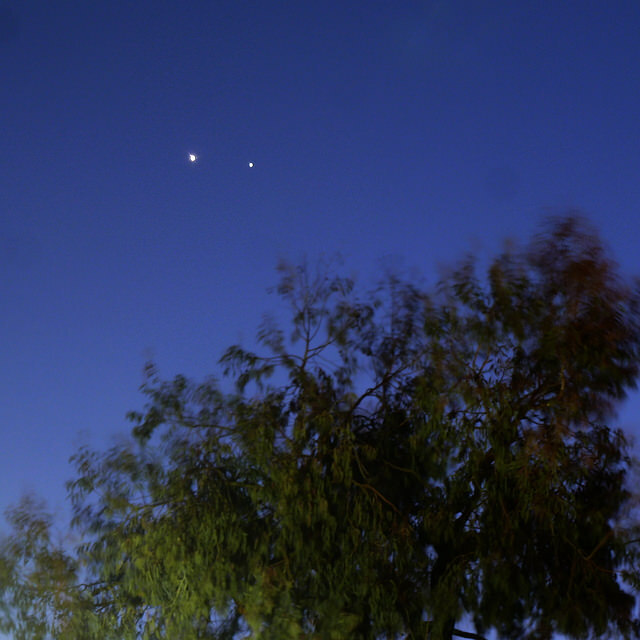 You really don’t notice how much brighter Venus is than Jupiter until they’re right next to each other. Jupiter is much bigger, so it reflects a lot more sunlight, but it’s also a lot farther away. Also, that conventional wisdom about how stars twinkle, but planets don’t? Not true. In turbulent air, planets absolutely twinkle. Two nights later on July 2, I walked outside facing west. 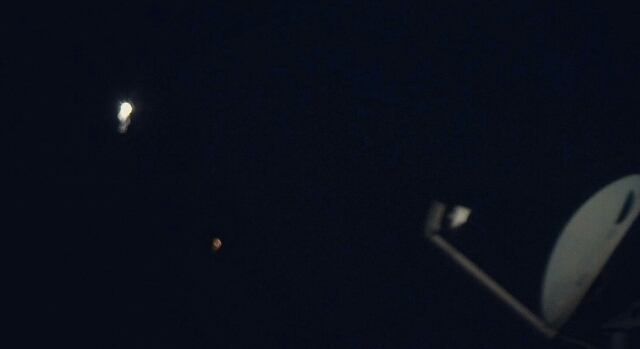 The sky near the horizon was still orange, but the two brightest planets were clearly visible against the deepening blue. I didn’t have a tripod handy that night, so I used the top of the car, which conveniently lined up with Jupiter and the chimney. 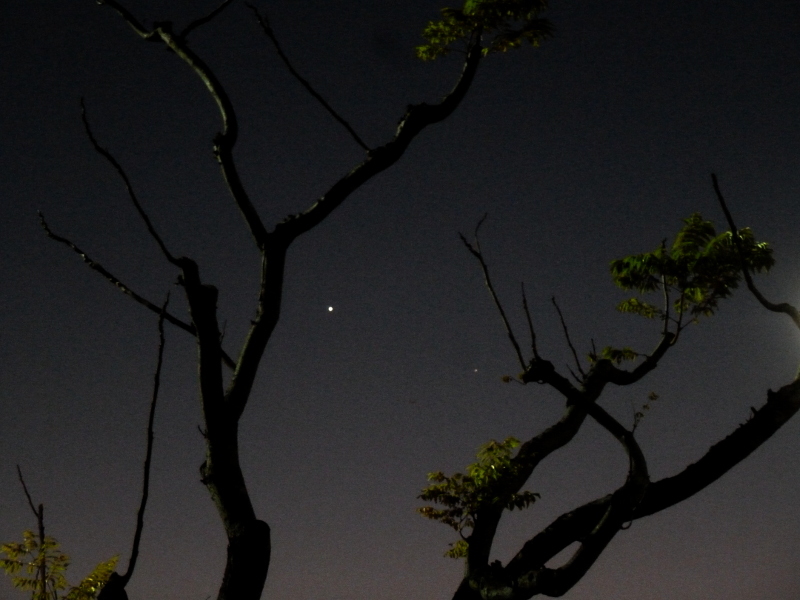 This entry was posted in Photos, Space and tagged Jupiter, night, Stargazing, venus on July 5, 2015 by Kelson. My tripod, on the other hand, seems not to have been as steady as I thought. Or I jostled it a tiny bit, enough to register on Venus but not the much dimmer satellite dish. 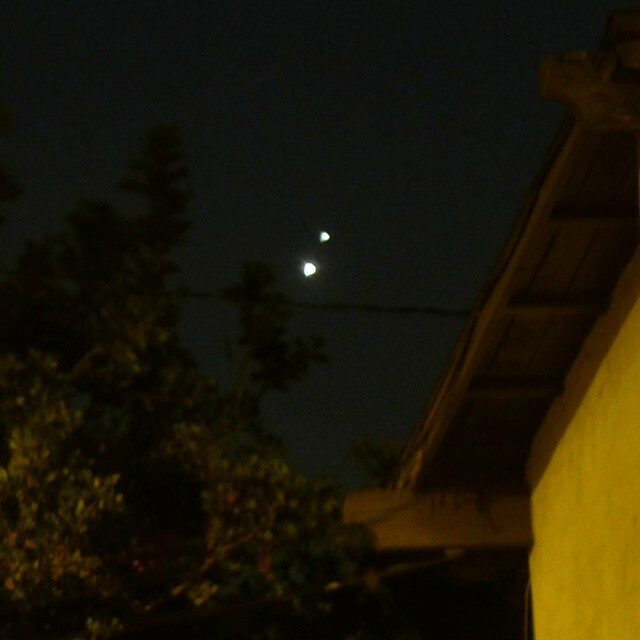 Speaking of dimmer, though….wow, nothing like a conjunction to remind you just how much brighter Venus is than, well anything else in the night sky except the moon. 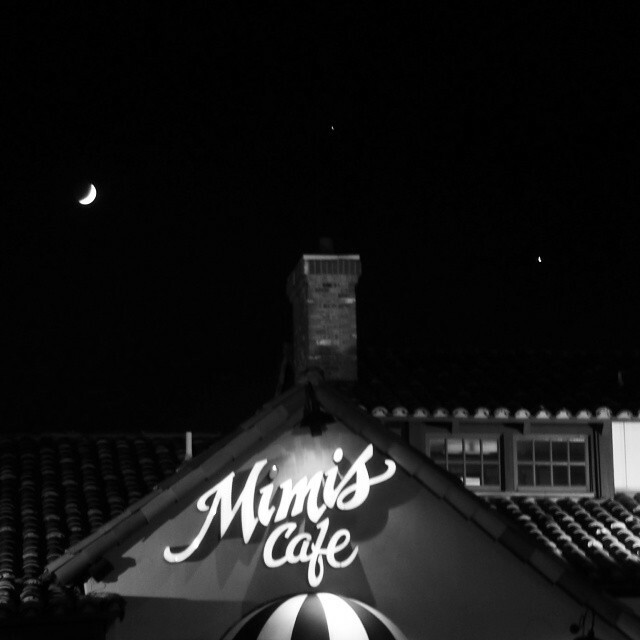 This entry was posted in Photos and tagged Mars, Stargazing, venus on February 23, 2015 by Kelson.